new O R I G I N A L S are here for F A L L ! In autumn, we all start to unwind from the craze of summer and start to stay in our homes just a little bit longer. This to me, is when I start to want to redecorate, unwind and refresh my living space. This collection initially began naturally because I wanted some new work on my walls, but somehow naturally, a new series began instead! Inspired by minimalism, natural elements, and calm energies, this collection is definitely one of my favourites and feels truly authentic to my creativity and self expression. This collection of original paintings consists of 6 pieces, all in which work together in harmony while still maintaining an individuality within themselves. Three pieces have been painted on 300 lb heavy weight watercolour paper, which has been the first time I have used this type of surface for a piece. 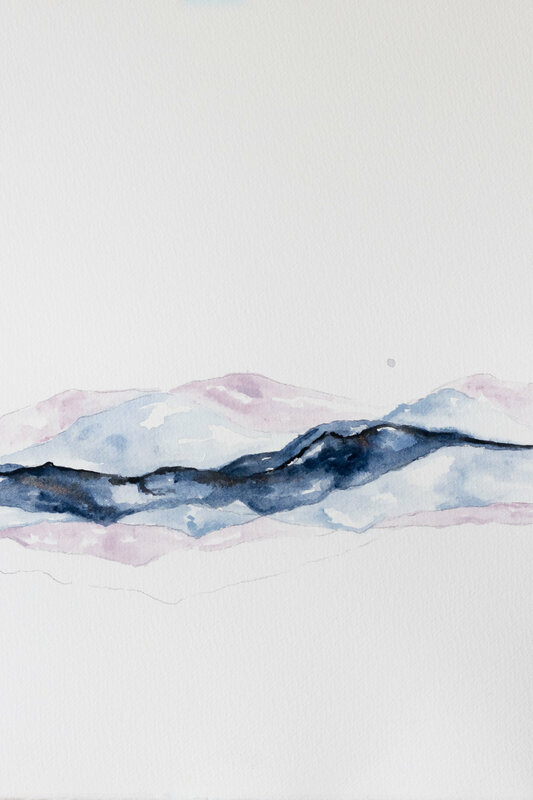 These 3 were inspired by mountainous landscapes and the powerful and stillness they represent. Two other abstract pieces have been done on canvas sheets, and are much more about the calm, and luminous force of the east coast waters. Softly swaying their tones poetically while still maintaining a modern, simplistic feel. Finally, I left the last piece to be a monotone, tranquil landscape painting, allowing you to bring the outside into your space on gallery wrapped canvas. I hope you enjoy my new set of work and find something you'd like to bring into your home, work space or for a loved one for an intended gift for a special occasion or the holidays coming in a few months! If you end up having any questions please don't hesitate to ask! S H O P now ! If you know me you know I'm fueled by coffee during my day. Can I get an AMEN?! I had such a blast with the craze of doing holiday ornaments in December that I thought to myself what other items could I design that could be used and welcomed by you all. I do all my brainstorming in the morning (while sipping on my coffee) and I looked down and it was staring right at me. COFFEE MUGS! Dishwasher safe, with a minimal paint splatter design, they easily can fit a big ol' dose of tea or coffee in your hands. I am an avid coffee drinker, and I'm such a fan of big latte style mugs that I hand chose this style to fit those needs perfectly. These are now available for purchase through myself or my website so feel free to take a peak and let me know what you think! Fine Art Prints Are Here! Fine Art Prints are now in the shop! After a long time in the making, I finally have my art prints available for you all! I have been planning and researching prints for almost two years now, being very picky in the process. I found a fantastic printer, who does amazing work and made sure they were the highest of quality, resistant to fading, true to the colours of my originals and still look like they're on a canvas texture. Each fine art print I chose to launch are 8x10 inches, signed on the back, numbered and dated, along with some cute personal touches added by me! These are limited edition prints, perfect for smaller walls, apartment spaces, or set as a beautiful trio along a bigger wall as a statement piece in itself. I chose these particular originals to get printed because I felt they were all versatile beside each other for decor purposes and were some of my favourites from my last collection! I hope you all enjoy ! !